Bart Chezar, Kate Orff, Gena Wirth, Lucas Rauch, Nefeli Kalantzi, Shimrit Perol Finkel (Sea Arc), Ido Sella (Sea Arc), Timothy McKinney, Tim Chezar, Michael Judge (PhD Professor and Chairperson of Biology, Manhattan College), Tom Outerbridge (SIMS Metal Management, Brooklyn NY), the New York Harbor School, Mauricio Gonzalez and Students, and the Cornell Extension Services Seagrass Center. All images courtesy of Scape/Landscape Architecture and Bart Chezar. 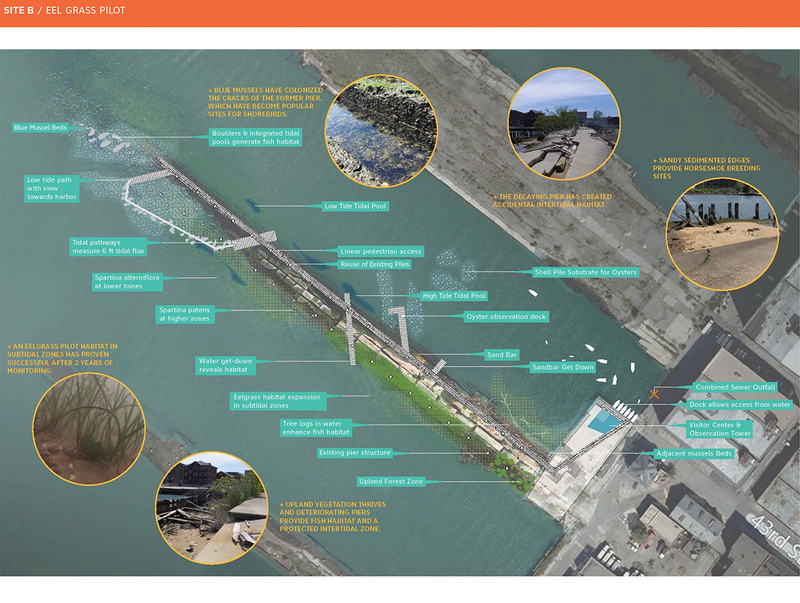 01.The Harbor Habitat Piers project advances research as a form of activism to test water quality and habitat viability, and to preserve and reimagine the post-industrial shoreline. 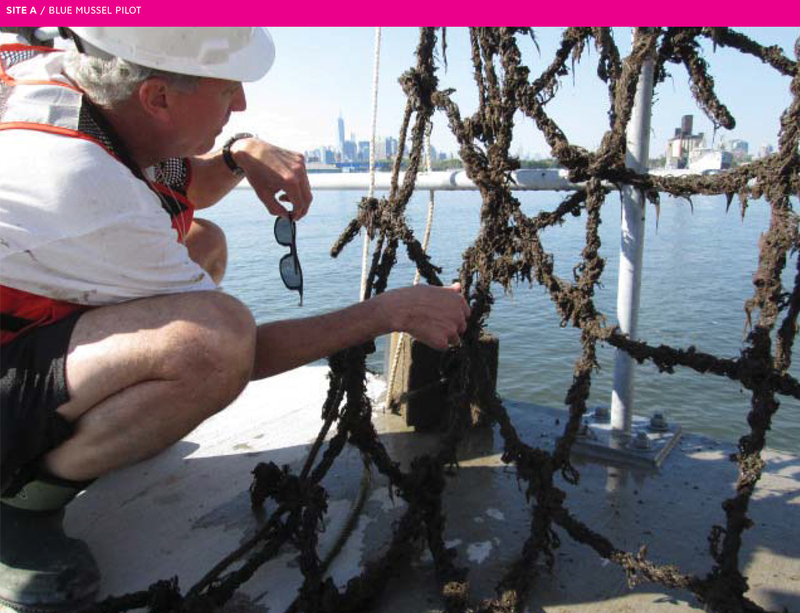 This self-funded urban ecological experiment transformed two sites within New York’s Inner Harbor (site A) and Gowanus Bay (site B), both located next to sewage outfalls, and conducted tests for the presence and viability of blue mussels and eelgrass. Eelgrass in particular is considered an “indicator species” since contaminants negatively affect them. 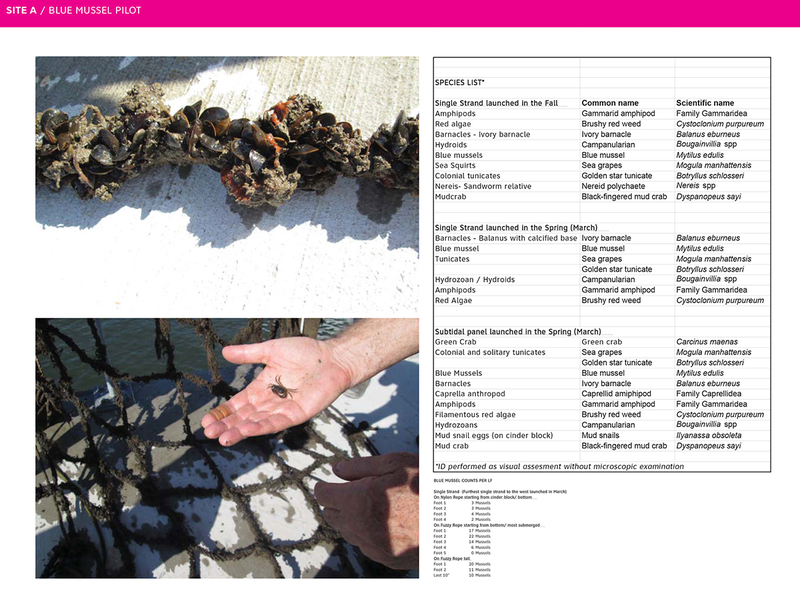 for a range of species, including amphipods, eastern oysters, filter feeding tunicates, and sponge and algae species. 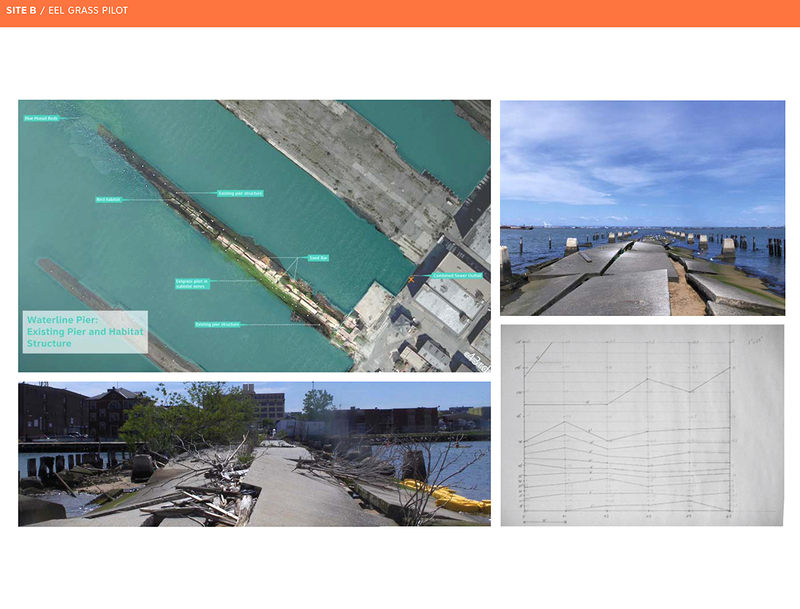 This test site is located along an active industrial pier at SIMS Metal Management Facility, close to the mouth of the Gowanus Canal, in Brooklyn, New York, which is a superfund designated zone. A02. This project tests the use of fuzzy rope, a material already utilized in the aquaculture industry for recruitment purposes, for alternative restoration-oriented purposes. 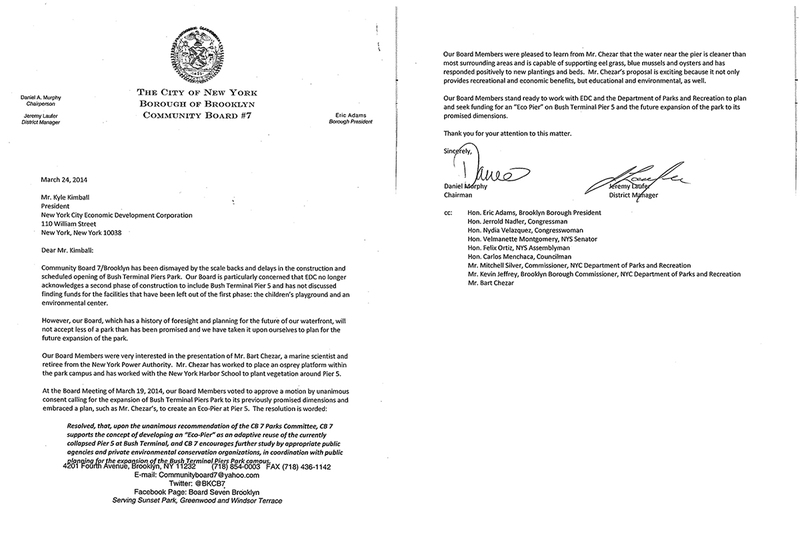 The project is temporary, as the rope has an expected lifespan of six to eight years. 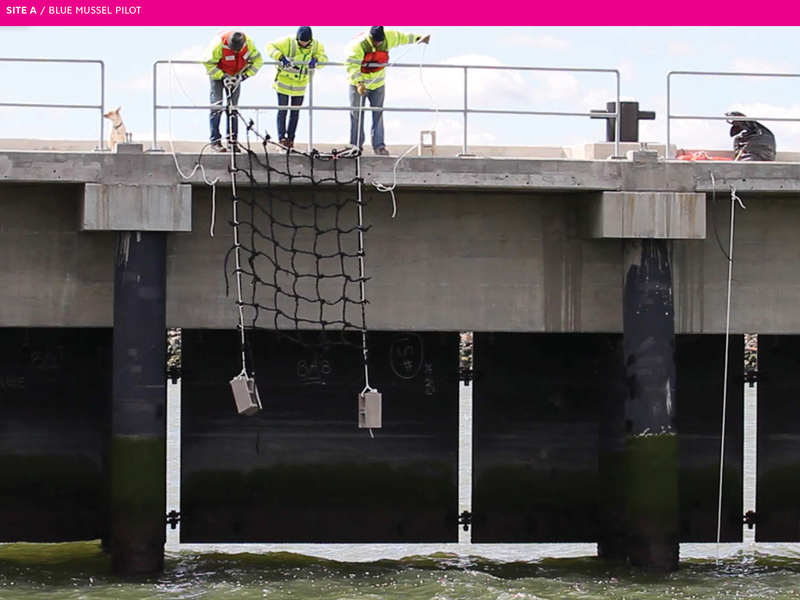 The project consists of thirteen fuzzy rope panels as well as test squares for low pH marine concrete. 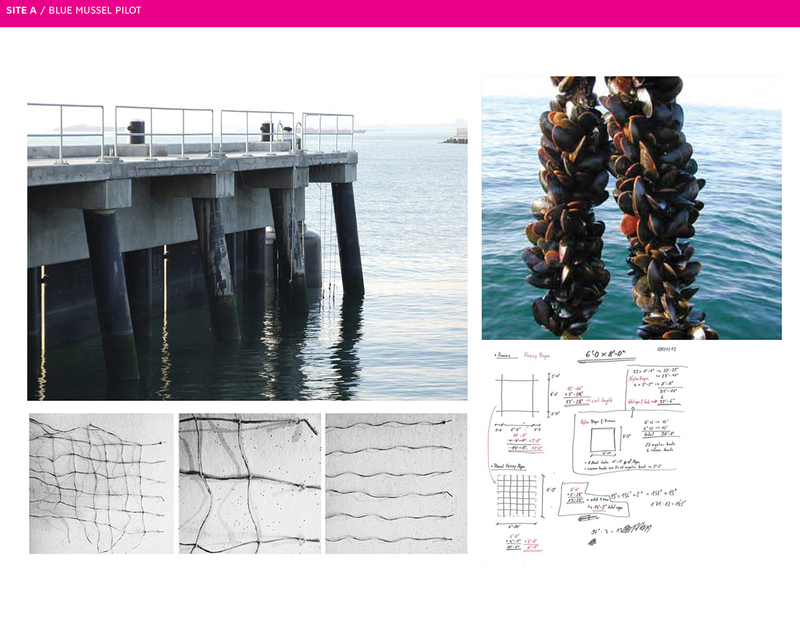 Three typologies were devised to test for the presence of blue mussels and other shellfish: a single-strand fuzzy rope, an intertidal panel, and a subtidal panel. The panels are designed to attract and host existing mussel larvae, providing a man-made substrate for bivalve recruitment where currently none exists. A03. 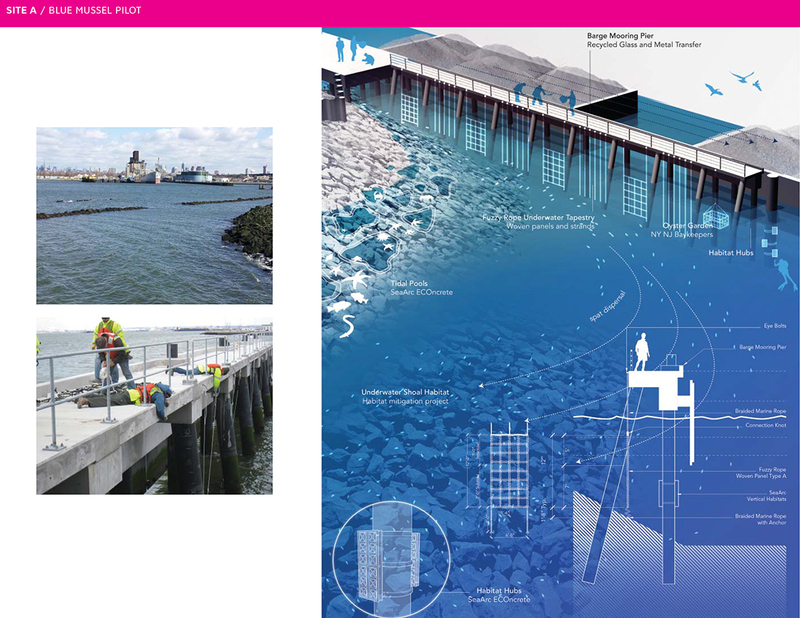 The site strategy was to retrofit the working pier with habitat enhancement structures that do not conflict with its active use. 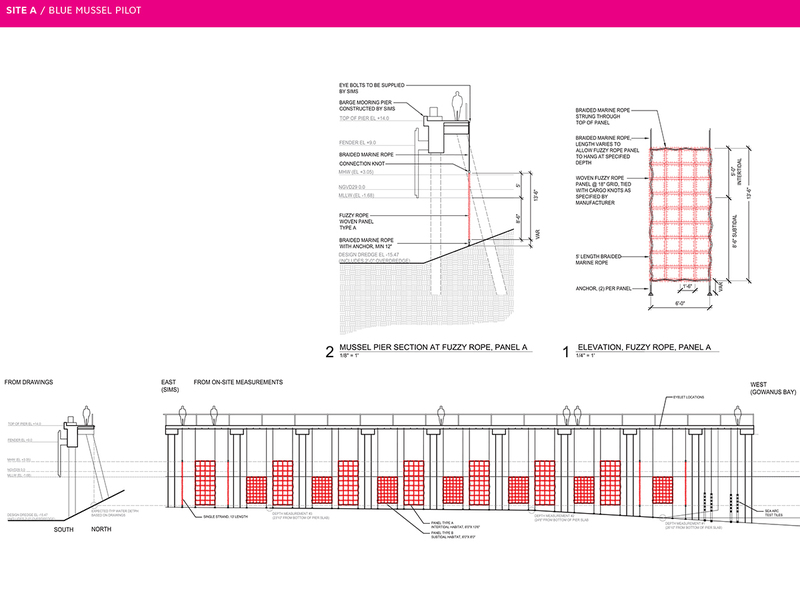 Thus, the project can test restoration efforts that can coexist with active urban industrial sites rather than focusing solely on abandoned post-industrial or parklike sites. A04. 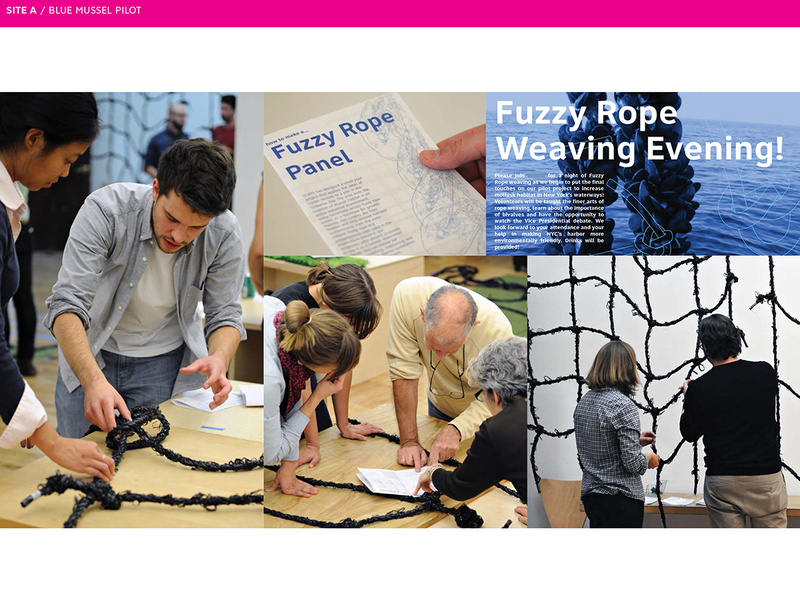 The fuzzy rope panels were constructed during a public “Weaving Evening” event with a group of local volunteers, using simple rope-knotting techniques and a mix of typical marine rope and fuzzy rope. A05. Panels were lowered into the bay at precise locations. A06. Panels were removed from the water for observation and monitoring by a local university at two time intervals [what time intervals?]. We noted substantial blue mussel attachments on the fuzzy rope, in addition to an expanded species diversity over time. A07. The project team worked with professor of biology Michael Judge of Manhattan College to monitor the fuzzy rope panel installation for species diversity and mussel recruitment number and size. A parallel study was performed by SeArc, an Ecological Marine Consulting firm, to test biological recruitment on Econcrete tiles, a special low pH designed for marine construction. The tile prism was cast with an innovative concrete matrix designed to promote marine biological assemblages such as oysters, mussels, sponges, and tube worms. This concrete complies with the requirements for marine construction (compressive, flexural and splitting tensile strength, chloride permeability), and this sample utilized recycled glass from SIMS recycling facility, which hosted the pilot, as an aggregate. Glass is known as a good substrate for biological recruitment so testing for this underutilized resource for marine construction will have environmental benefits both above and below the waterline. B01. At Site B, further out in the harbor, away from the canal mouth where water residence time is lower and flushing activity is more prevalent, we tested for the presence of eelgrass at a decaying pier that is no longer in active use. The pier, over time, has collapsed into the water, creating an accidental intertidal habitat. B02. Eelgrass is an “indicator species” for water quality. Twenty “tortillas” (8-inch-diameter burlap circles) containing eelgrass cuttings were planted by Bart Chezar at roughly 4 feet below Mean Low Water (MLW). 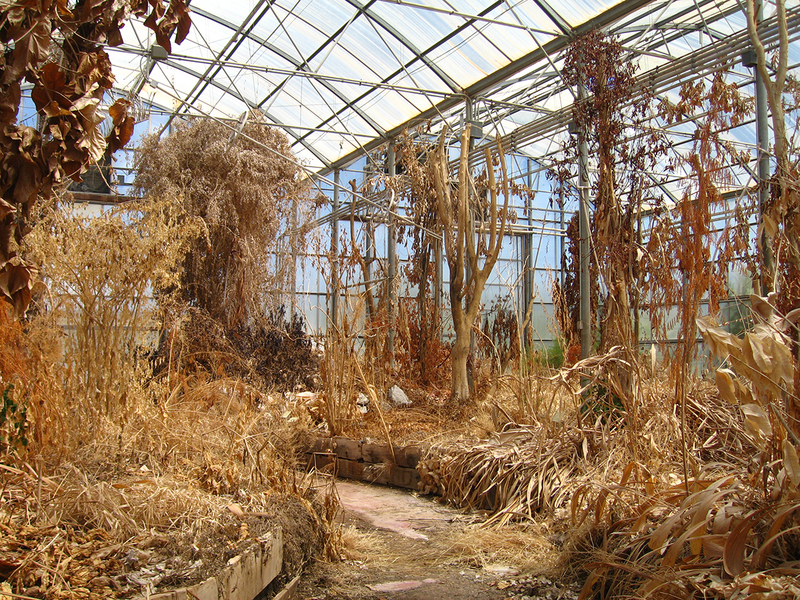 The cuttings originated from Orient Point, Long Island. The eelgrass had a high survivability rate, although its numbers were diminished by the presence of mud snails. The pilot plot survived Superstorm Sandy and is still extant. Frequent site visits have noted the successful growth of eelgrass plot, a large colony of blue mussels, horseshoe crabs and sandy sedimented edges, oysters, upland vegetation, and bird nesting sites in a remarkable density of urban ecosystems. by “deconstructing” the elements of a natural salt marsh and making them visible to students and community members, and to preserve and reimagine the post-industrial shoreline. 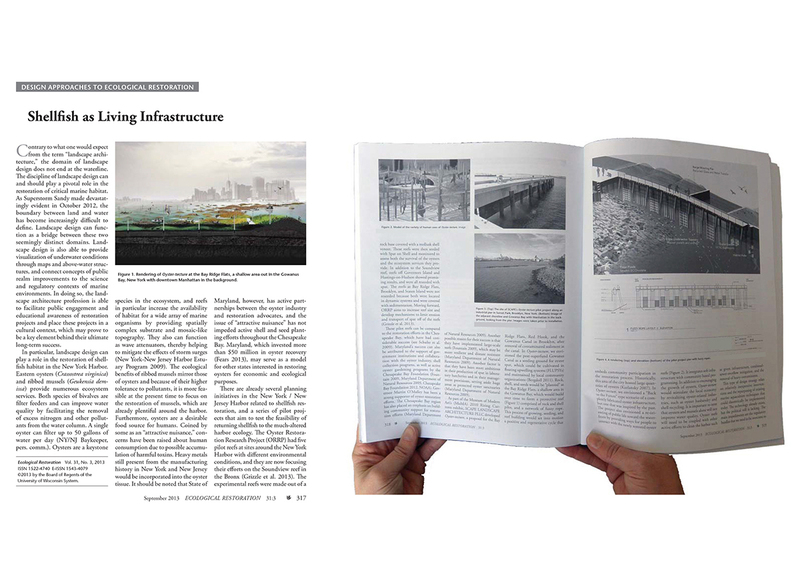 The associated proposal for a “deconstructed salt marsh” based on the remarkable existing landscape typologies explores the opportunity to repurpose this existing yet collapsed pier as a space for additional test pilots and posits that it could become a learning laboratory for waterfront habitat and a tool to generate civic engagement that will serve jointly as a host for science experiments for local ecologists. A typical salt marsh consists of several well-defined biomes and physical features. These zones include subtidal marsh, mudflats and intertidal marsh, upper marsh, supratidal swamp, and forest. Within these zones there may be saltwater and freshwater pools. 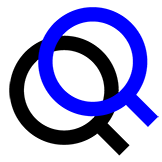 By deconstructed we mean breaking something into its elemental parts to understand how it is constructed and how its components function. Since we do not have the land or resources to (re)create a fully integrated (natural) salt marsh, we propose a deconstructed one. 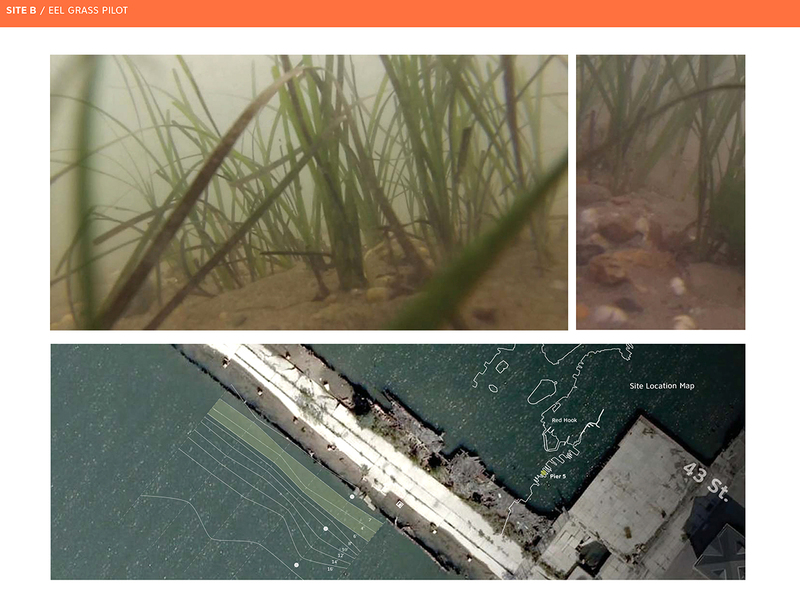 Along the pier we would create discrete components of each of the major elements of a salt marsh. This newly created salt marsh would be creatively integrated with the historic remains of the pier. B04. 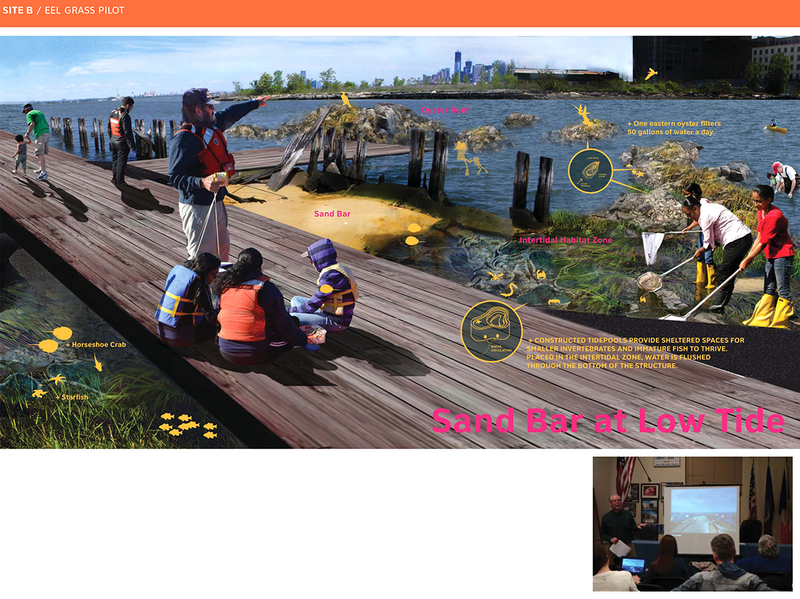 The proposed project is intended to provoke a public dialogue about an approach to the redevelopment of this site, highlight the values of intertidal habitat in New York Harbor, and to explore the potential for integrating soft edges, scientific study, community engagement and educational programming into the urban landscape. B04. The habitat mapping, eelgrass pilot results, and proposal were presented to the local community board and were commended and recommended for further study and advocacy. 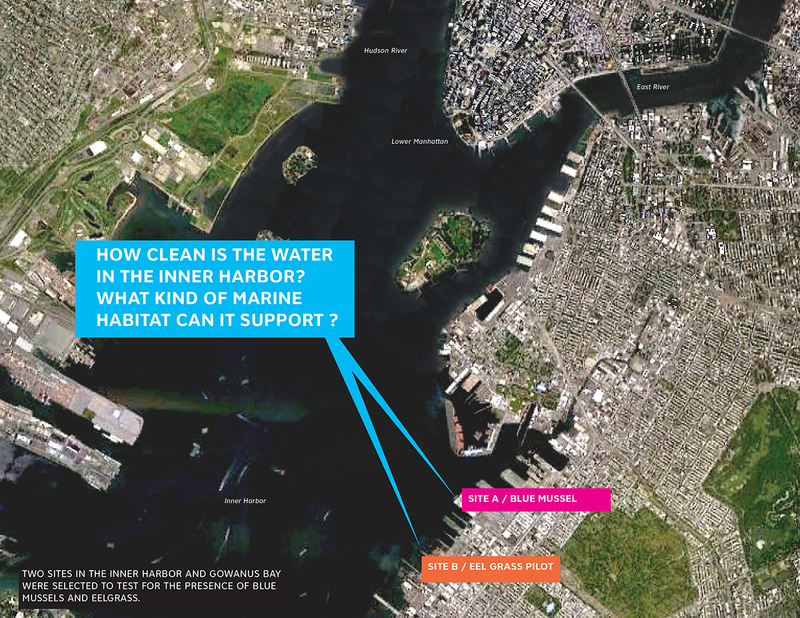 In addition to creating an important biological habitat, it would become an example within the community of how to take the evolving urban shoreline infrastructure and create a “soft edge,” a strategy being recognized as important in dealing with our future of rising sea levels and climate change. Kate is the founder of SCAPE / LANDSCAPE ARCHITECTURE and is an Associate Professor of Architecture and Urban Design at Columbia GSAPP. My business partners were needing AWS Form N-1 earlier today and were informed about a web service that hosts 6 million forms . If people are interested in AWS Form N-1 too , here’s https://goo.gl/gyj0Fx.